Before the days of dehydrated food, instant coffee packets, and saliva inducing trail snacks, meals in the outdoors were a much more boring affair, and quite a deal heavier. The outdoor industry arguably began in the late eighteen hundreds with the establishment of National Parks and the birth of the Sierra Club. Then, in the 1940’s the Army’s 10th Mountain Division training in the Colorado Rockies launched what we now know of as the modern American ski industry. Soon after in the 1950’s, climbing in the Yosemite Valley exploded. All of these events sparked the creation of companies geared towards outfitting people for their favorite outdoor recreation. The early nineteen hundreds saw the design of an early wooden-frame pack board and soon after we find stories of outdoor enthusiasts braving thru-hikes with minimal gear. As far as cooking goes these men and women carried simple mess kits mostly made from steel and their food consisted of rice, beans, bread, and maybe some canned meat. Overall a simple, yet rather tasteless menu…unless you’re into that sort of thing, which is cool. 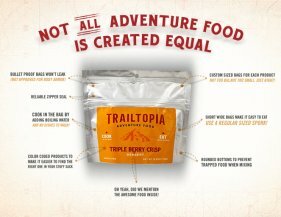 Today the options are endless and trail food companies design their products with an active lifestyle in mind. Meals, snacks, and hydration tabs come chock full of calories to keep energy levels high. Freeze-dried Food: These food items rehydrate the quickest and retain their flavors better than dehydrated food. Usually you can find freeze-dried snacks in outdoor stores. Dehydrated Food: The options in this category are the most common for backpacking and camping. Dehydrated meals are more compact than freeze-dried meals but weigh slightly more. Precooked Meals: Military surplus meals, such as Meals, Ready-To-Eat (MRE’s) are another alternative that provide 1,200 calories each! Everything you need for the meal in included but its weight can be a deterrent if you’re planning long trips. Ramen: This is always an option. Packs of Ramen are lightweight and only require water to eat; hot water is preferred but, in a pinch, you could eat it cold. 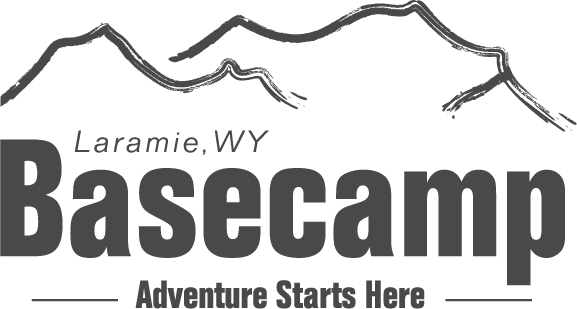 At Laramie’s Basecamp we carry Trailtopia, a family-run business out of Rochester, Minnesota. 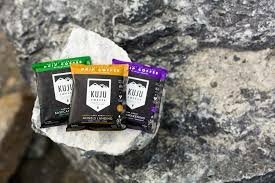 The founder, Vince Robichaud, created the packaged meals from many years of experience outdoors and a search for healthy, hearty, homemade options. They offer breakfast, lunch, dinner entrees (1 and 2 servings), dessert, and side protein packs. You can also purchase a 3- or 5-day bundle for two people that includes all the meals you’d need. Vegetarian and gluten-free options exist, and their website offers a wealth of information in terms of meal planning and nutritional tips as you’re preparing for your next adventure. They advertise that each packaged meal is a one-utensil meal and they offer 7 creative uses for your empty meal bag. reusable filter fits a variety of mugs and containers. 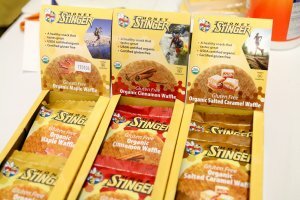 Honey Stinger waffles and gummies use honey, a natural form of energy and antioxidants, and they provide a mixture of carbohydrates that is better tolerated by your body than a single carbohydrate form. 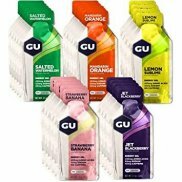 Energy gel GU, also in shop, delivers critical carbohydrates for energy and amino acids for muscle support. Food made simple for expeditions and outdoor travel has existed for a very long time. I found mention of dried soup in an article regarding Lewis and Clark’s expedition West! The options today are far more delicious, weightless, and easy to cook. Check out our camp cookware to pair with your trail food here and stay tuned for an upcoming blog post detailing the new Osprey backpacks that arrived. Carrying all this delicious food is only worth it if your pack fits!